What's so special about Vegas. 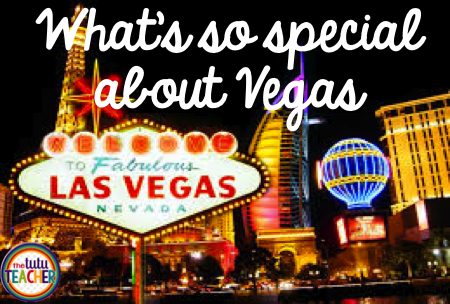 What's so special about Vegas? What is so special about my time in Vegas was the chance to meet, collaborate, and bond with like minded teachers. Teachers who wanted to make a difference in their classrooms and classrooms around the world. 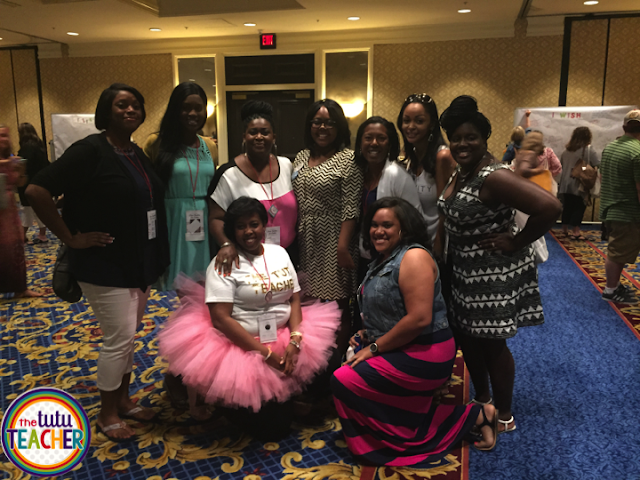 Teachers who shared their ideas and tips with one another. Teachers who "like" your posts on Instagram or comment on your blog posts, and hug you hard, as if you've been friends for years. Those teachers, made my time in Vegas truly special. Last year, I had the wonderful opportunity to go to the first official Teachers Pay Teachers conference. It was also a lot of fun You can read all about last year's adventure here. I didn't even think it was possible, but this year was even better! I learned so much, met so many amazing people and had the time of my life! Let me walk you through my time in Vegas. I arrived Monday night and went straight to bed. My flight got in at 12:30 a.m Las Vegas time which was 3:30 a.m. on the East Coast. I was exhausted! 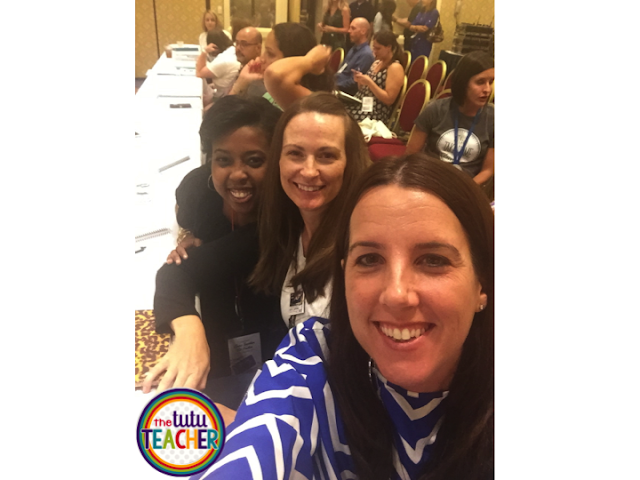 The next morning I had to get up to attend my first session at I teach K! The next day, I woke up super early and got ready for a day of learning. I grabbed some coffee and a snack and headed up to register and to check out the Expo (where vendors were showing off their goods), before going to my first session. I didn't make it to my first session because I got so enthralled with the people in the Expo center. I'm a people person and once I start talking...I kind of can't turn off. I'm a super extrovert and the people at all the different booths were extroverts too. 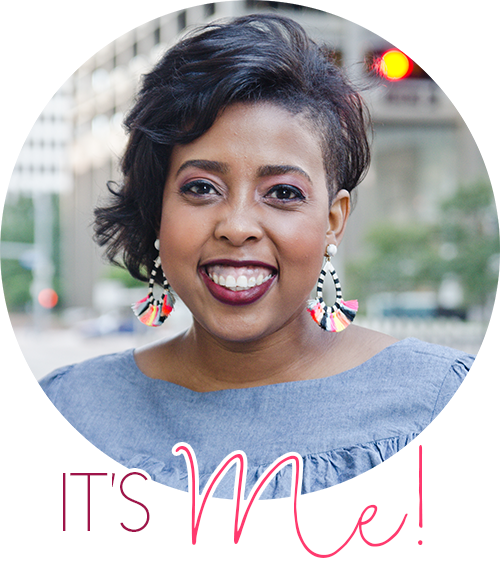 click on the name and find out more about how awesome she is. How awesome are those aprons!? A little background, Sandra and I met last year at the Expo and we hit it off! Of course when she met me I was rockin' a purple tutu! Well that tutu inspired her to do a like of tutu aprons. And when we say each other we could not stop talking about how much we loved each other. And she is making me my very own custom tutu apron! Isn't she the best? 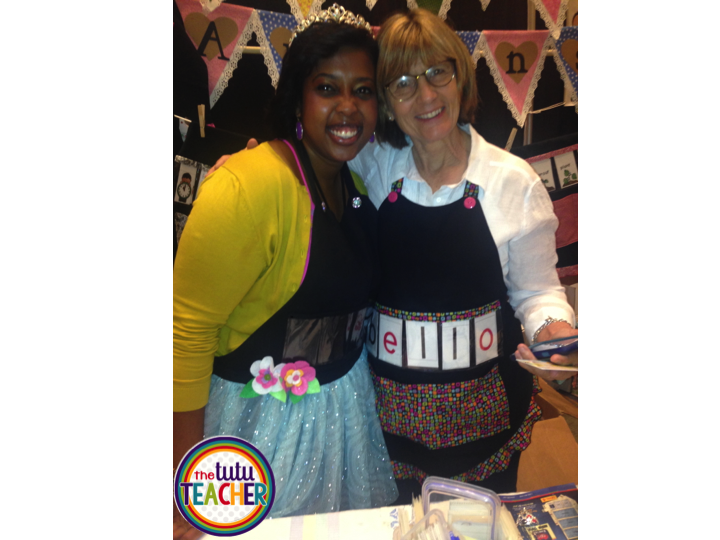 She let me model one of the tutu aprons! Can you even? I can't even! I even got a chance to kick with some of the best male early childhood educators in the world! Not only are these guys smart, they are so kind and generous. then click on their names and start following! 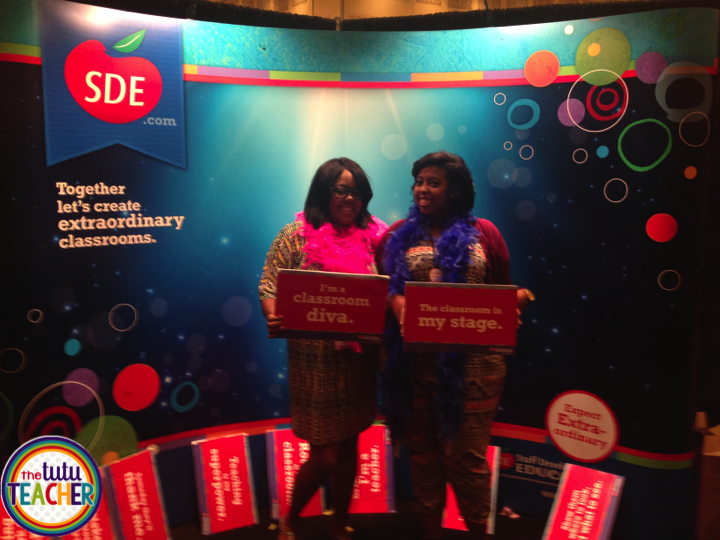 I also had a blast goofing around at the SDE photo booth with Keri from Enchanted Kindergarten! I finally stopped talking long enough to get myself to my next session. My presenter was Autumn from The Primary Techie. When I say she was awesome...that is an understatement. She has some of the best, thoughtful, and well planned ideas I have ever seen. but Autumn's presentation blew me away! to work at their booth during the conference. And "working" the booth is just code word for dancing. I had a blast doing the Pop See Ko with Freckles! 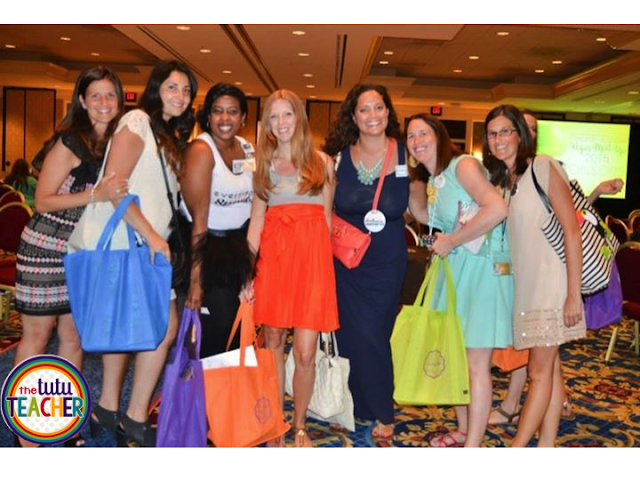 Wednesday night was the HUGE blogger meet up. 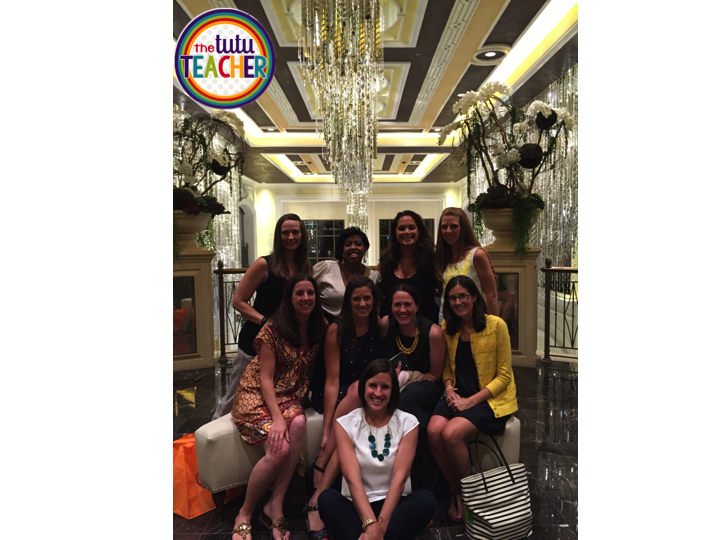 I was so excited to meet so many fabulous teachers and teacher bloggers. 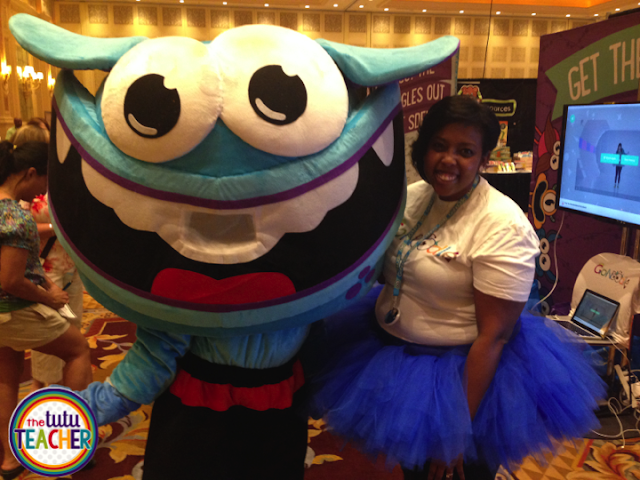 I even wore my fancy tutu for this special event! 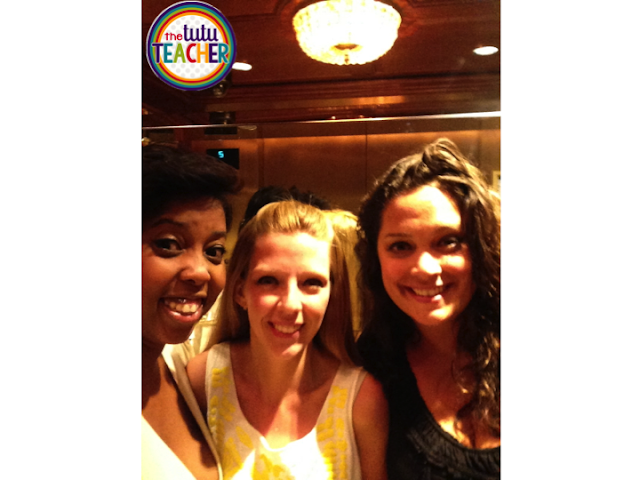 I finally got to meet the AMAZING Natalie, one half of What the Teacher Wants. I think we became best friends that night! 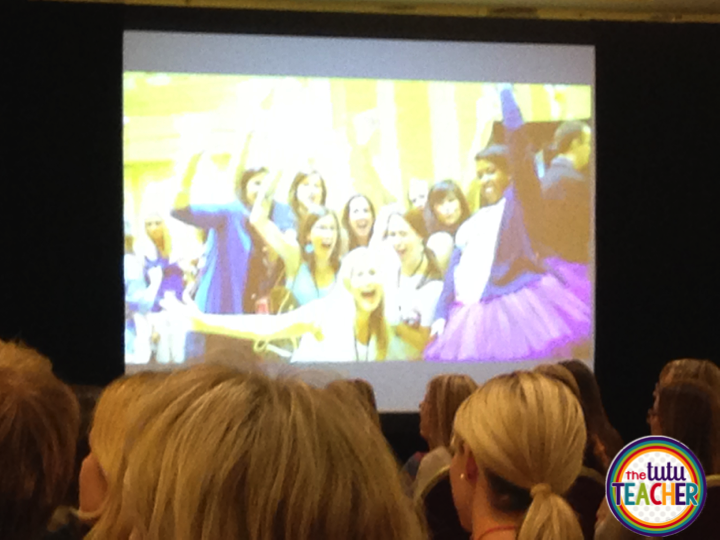 The next day was the first day of the TpT conference. Thursday was full of great collaboration opportunities. 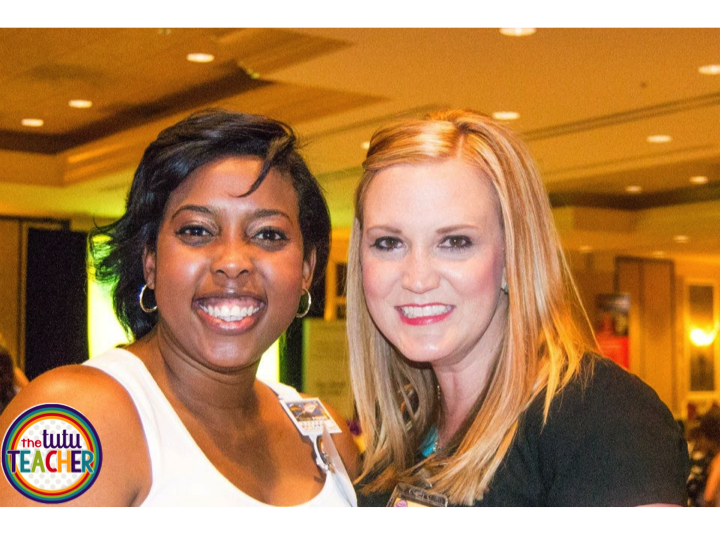 I went to a Kindergarten Meet and Greet and got to know some amazing kindergarten TpT sellers. I learned a ton in my sessions and could not wait to see what Friday's full day would offer. When I woke up on Friday and put on my pink tutu...I had no idea what the day had in store for me. Mary from Adventures in Kindergarten and Jillian from Starr Spangled Planner. Welcome and Keynote speeches to begin. We listened to words of wisdom from Amy and Matt, two very important members of team TpT. Paul Edelman the founder of Teachers Pay Teachers gave a very inspiring speech. made on teachers, classrooms, and students all over the world. 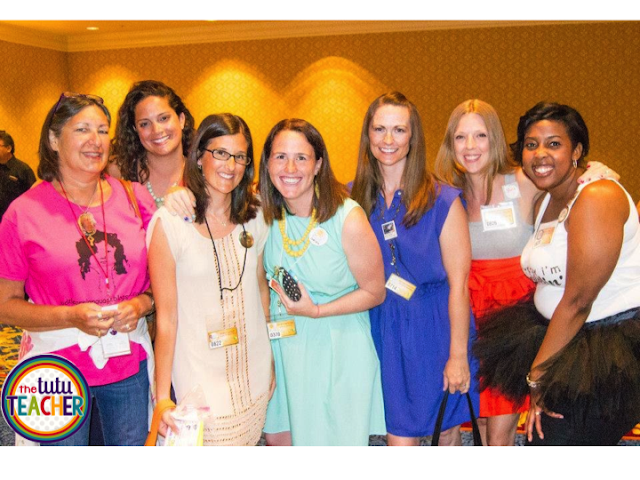 this picture of my friends and I at last year's conference appeared . 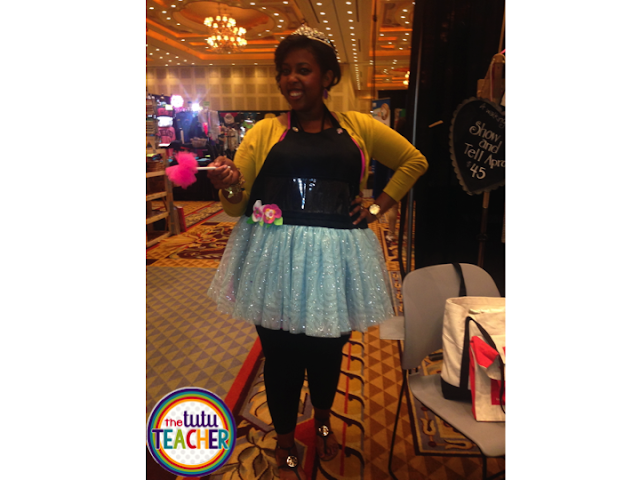 Paul asked, "Is The Tutu Teacher here?" in the room and sat down quickly to freak out in private. dizzy with excitement and gratitude. I know I've mentioned how it's easy to feel like a little fish in a big sea. 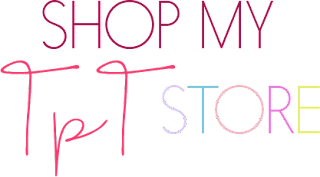 Whether you're blogging or selling on TpT or just trying to survive your first year teaching. And sometimes you feel like your hard work goes unrecognized or isn't appreciated. But sometimes it is in the most wonderful ways. I was so humbled and honored and ecstatic and lots of other adjectives. Friday's sessions were amazing and I learned a ton. I filled my notebook with ideas and plans and "Gotta dos"! 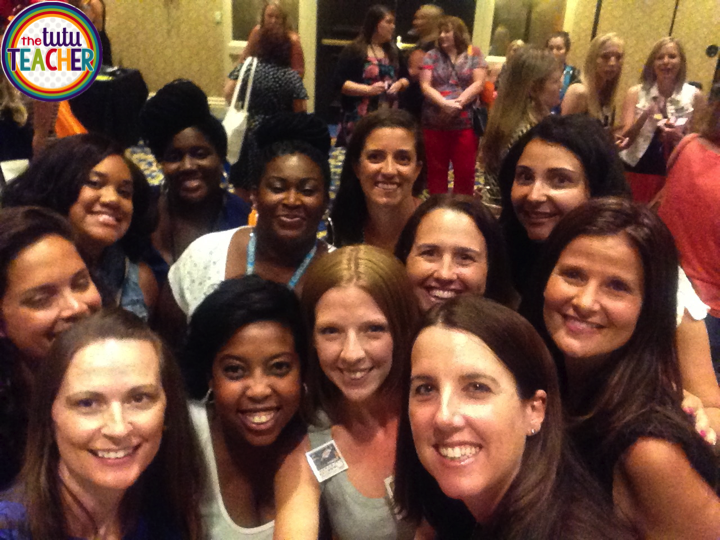 not just to do better as a seller, but do better as a teacher. To try different ways to reach my kiddos. To try to inspire other teachers to inspire their students too. I wish I had more time to meet more people! If you didn't go this year, or last year...please look into going in 2016. 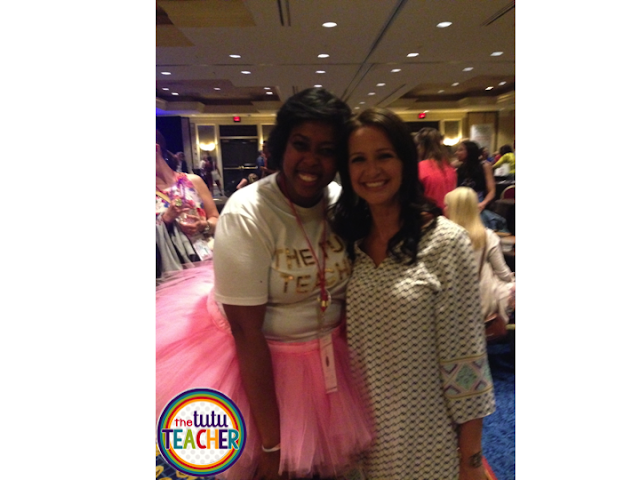 If you took a picture with me in Vegas, could you please email it to me at thetututeacher@gmail.com? I'd love to include it in the pictures below. 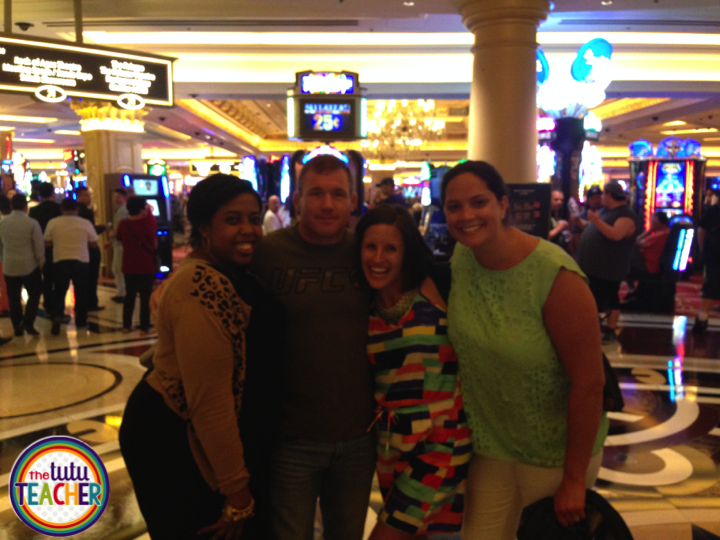 Here are a few more pics of my experience in Vegas. I didn't get a photo of us, but just wanted to say it was so nice seeing you again! You are so cute and I just love your energy!! !